Ghayebloo, S., Tarokh, M., Abedzadeh, M. (2013). Closed-Loop Supply Chain Network with Green Supplier Selection and Disassembly of Products: A Bi-Objective Model. International Journal of Research in Industrial Engineering, 2(4), 58-71. S. Ghayebloo; M.J. Tarokh; M. Abedzadeh. "Closed-Loop Supply Chain Network with Green Supplier Selection and Disassembly of Products: A Bi-Objective Model". 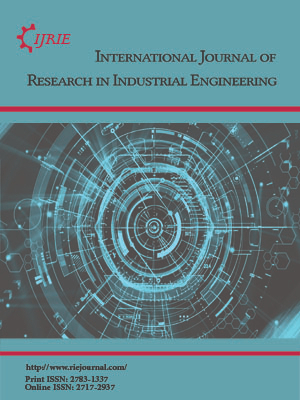 International Journal of Research in Industrial Engineering, 2, 4, 2013, 58-71. Ghayebloo, S., Tarokh, M., Abedzadeh, M. (2013). 'Closed-Loop Supply Chain Network with Green Supplier Selection and Disassembly of Products: A Bi-Objective Model', International Journal of Research in Industrial Engineering, 2(4), pp. 58-71. Ghayebloo, S., Tarokh, M., Abedzadeh, M. Closed-Loop Supply Chain Network with Green Supplier Selection and Disassembly of Products: A Bi-Objective Model. International Journal of Research in Industrial Engineering, 2013; 2(4): 58-71. This paper aims to study the impact of product greenness and part reliability on reverse supply chain network through green supplier selection and disassembly of products. It proposes a bi-objective mathematical modeling for a closed-loop supply chain network considering green supplier selection and disassembly of products to trade-off profit and greenness. To our knowledge, this study is the first paper which considers the greenness of products in part/components level. So, some important issues such as part reliability, part greenness and inventory management of new and recovered parts are included into the model. Part reliability and part greenness are considered as green criteria in green supplier selection stage. Product greenness is defined according to design for disassembly level. Better design for disassembly means more greenness level for the products and better yield of parts at the disassembly stage. Green parts are made of highly recyclable materials. According to the part greenness and part reliability, some scenarios are defined. The greenness level of product is chosen by the model. ε-constraint method is applied to solve the model. A set of Pareto-optimal solution is obtained by using ε-constraint method to show the trade-off between the profit and greenness objectives. The results showed the efficiency of the model.